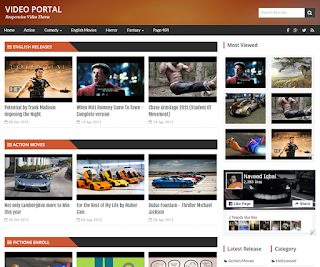 Video Portal is a clean design blogger template, specially designed for video blogs. We've manage to set Youtube iframe to fix and work proper on any high resolution or mobile device. We deliberately didn't add any slider in Video Portal to give it a more professional look. We have tried to add every widget that should be a part of a video blogger templates. 6 related videos with thumbnails and a subscribe form is added below each post in a very decent way. Whatsapp share button is set to work on any iOs or mobile device. Mobile friendly dropdown menu bar set to be activated on iPad's or any touchscreen device.